"We are only beginning to understand these processes," says Michael Sentef. "For example, we do not know precisely how strong the influence of the vacuum light would realistically be on the oscillations of the surface. 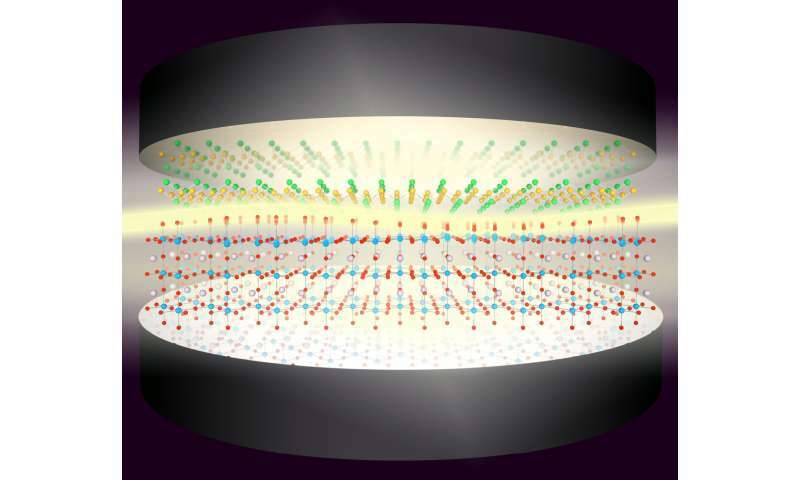 We are talking about quasiparticles of light and phonons, so-called phonon polaritons." In 3-D insulators, phonon polaritons were measured with lasers decades ago. However, this is new scientific territory where complex new 2-D quantum materials are concerned. "Of course we hope that our work prompts the experimental colleagues to test our predictions," Sentef adds. I recently made myself a note to look into what if any effect the virtual photon clouds that surround electrons could be having on superconductivity. This seems to be in that vein. I'm a layman but nevertheless interested but I need to be corrected over certain points. Is the vacuum force not more random than lattice structures and if so would using the vacuum virtual entities produces rather more random effects than controlled ones? It seems to be a *very* stretched analogy between short lived but AFAIU well defined polaritons and the less well defined non-resonant ripples in the EM field that we somewhat inexactly call virtual "particles". A virtual photon cloud or in a larger sense any screening "virtual cloud" around a well defined particle is a very poetic image that somewhat reminds of, say, "electron clouds" around an atom. The former connote screening interactions that modify the "naked" particle properties, the latter probabilities of electrons. But both have effects from their quantum statistics whether the probabilities are delocalized ("virtual particle" temporary ripples) or localized (particle locations in lattices). The model system here may help scientists understand vacuum effects, but it is a very vague correspondence it seems (to me) and they have their work cut out for them. If all "measures" are derivative of charge and every charge has a field that exist everywhere and is unique then to Not feel, one would require a "mixture" and/or distance, a media as a shield! Therefore, add the Forces of "the vacuum" are nonexistent for the static field of every charge as Ground Zero and the rest is"dunno" background radiation! That is, one cannot find what does not exists, "The Vacuum" is NULL! Logic! However, hypothetical. Ya gotta be stupid to mix that %hit up! Dafuq is that sh!t? Stop smoking whatever it is you're smoking. I dare you you locate a stationary charge in Free space, calibrate on 'dat, LOL! A 2005 paper by Robert Jaffe of MIT states that Casimir effects can be formulated and Casimir forces can be computed without reference to zero-point energies. The Casimir force is simply the van der Waals force between the metal plates.